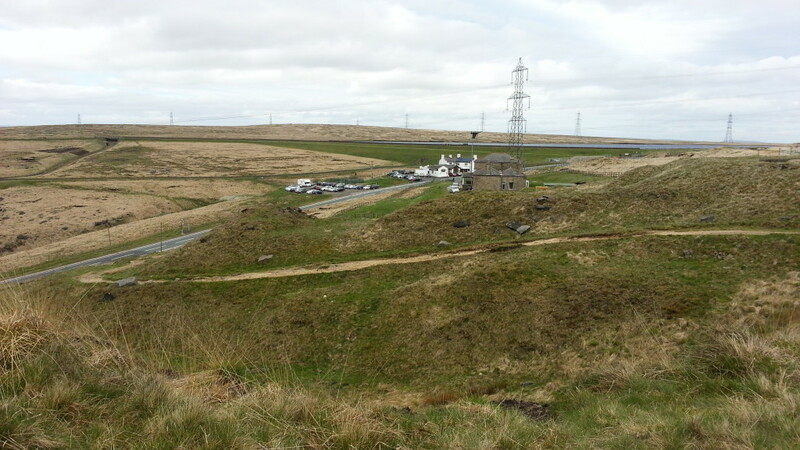 Standedge to Mankinholes. Approx 15 miles. Silka & Annette outside The Carriage House on a wet, misty morn. What a difference a night makes! Only a few hours before I had been sitting with Silka and Annette outside The Carriage House enjoying drinks in the sunshine and here I am the following morning taking a picture of these two delightful ladies in the pouring rain! 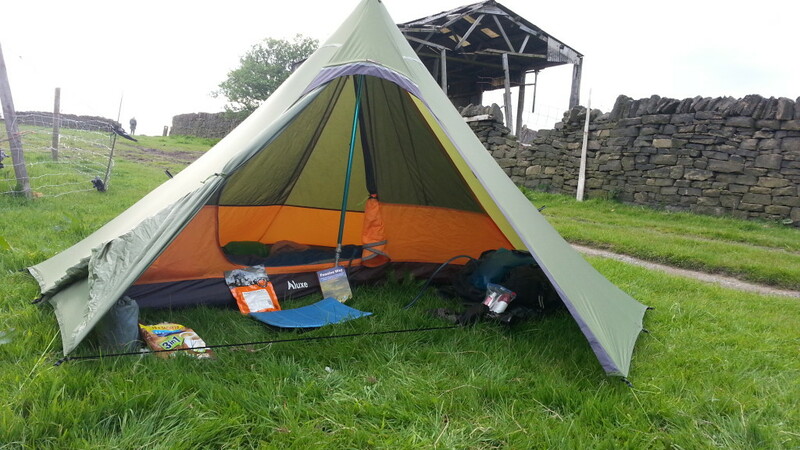 I had also slept poorly in my tent in the small camping area supplied due to some lively, but inconsiderate fellow campers talking loudly until the early hours of the morning. Still…I am not disheartened by such things and after a few moments posing for photos we were on our way on the next section of the Pennine Way. I say ‘we’ because this morning I would be walking with the aforementioned Silka (aka @silkskt on Twitter) and Annette and, as I was soon to discover, there is very little that puts the dampners on these two irrepressible walkers’ spirits! 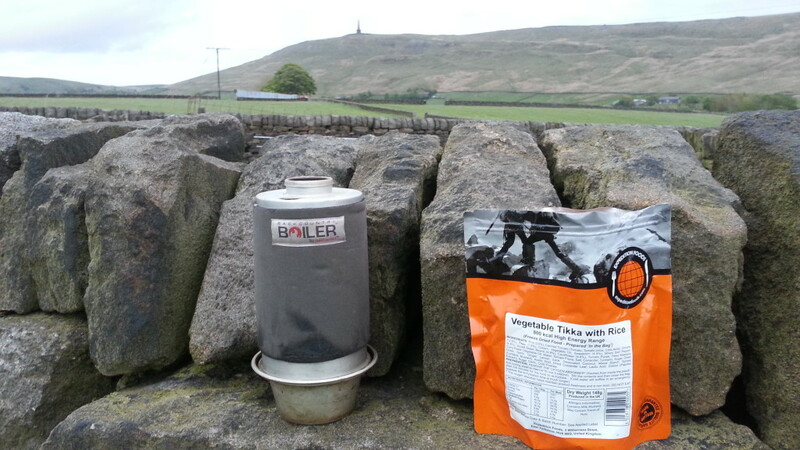 Heading back up the A62 to get back on the Pennine Way we were all thinking about the weather and whether or not it would improve… it was certainly wet and misty right now. As we picked up the Way again across Brun Moor the path was clearly defined and it wasn’t long before we reached Millstone Edge, the first of several gritstone edges that we would need to traverse this morning. The rain abated leaving us surrounded in clag, but every now and then the clouds and mist parted to reveal the beautiful views over Cattleshaw Moor and surrounding areas. 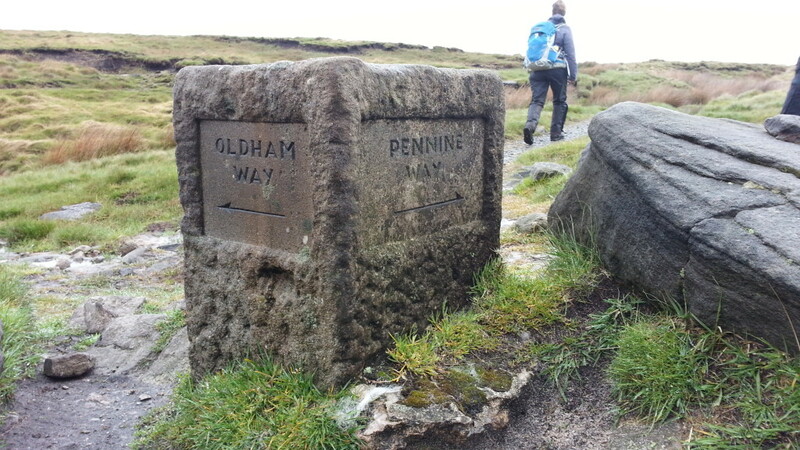 It wasn’t long before we reached marker that showed we had also been walking along the Oldham Way before we reached the A640 Huddersfield Road. 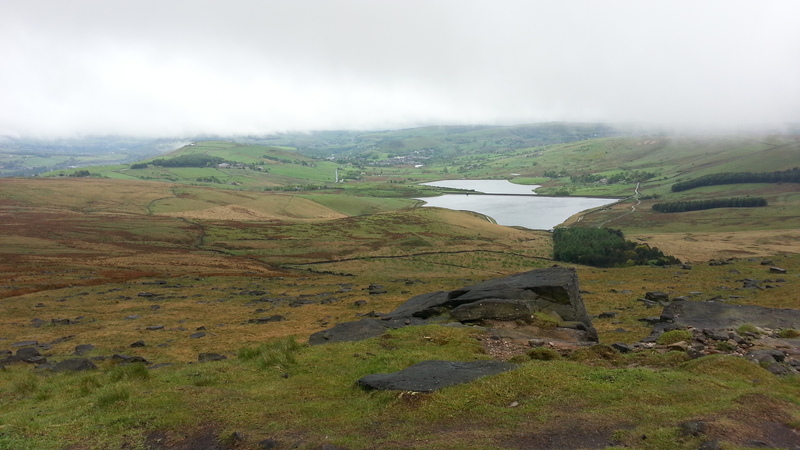 Past the gritstone edges the path opens up across White Hill and the mist was now clearing. 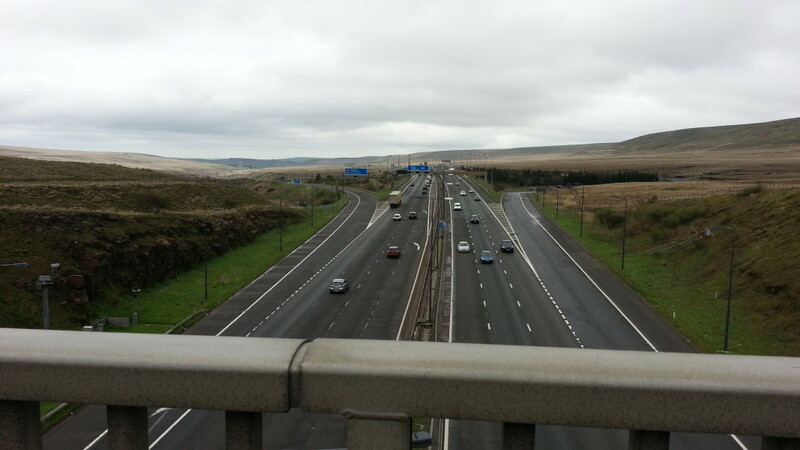 It wasn’t long before we reached the M62 Trans-Pennine Motorway and the purpose built bridge that soars high over the motorway beckoned. It is to Ernest Marples, the Transport Minister at the time, that we must thank for this most impressive of motorway crossing footpaths. A keen walker himself, Ernest’s forsight means that everyone can feel the thrill of standing above one of the busiest sections of road in the area. Crossing the bridge we hiked over the peaty expanse of Redmires which is now much easier to navigate thanks to the slabs laid in recent years and the hike up to the gritstone magnificence of Blackstone Edge and its trig point is a joy. 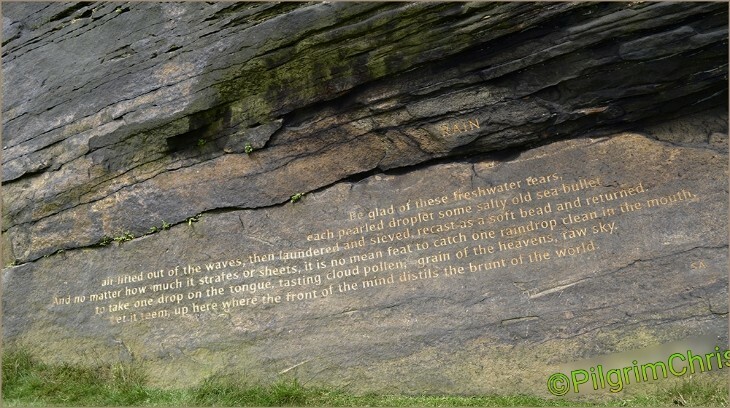 The Aiggin Stone just beyond has been guiding travellers for more than 600 years and is much more impressive than the modern concrete marker that we encountered before. By now we were all looking forward to lunch and we knew that The White House Pub. a former packhorse inn, wasn’t too far ahead. I had last visited this pub with my old friend Dean Read 2 years previously and forgot that the landlady isn’t the most friendly of ladies. Just like the last time I was there she made a big song and dance about charging my mobile phone – she even told me she had had the pub rewired so that hikers couldn’t plug their chargers into the now useless wall sockets! Still… the beer that was served soon washed that particular bad taste from my mouth and we enjoyed a simple bar meal before heading on our way again. 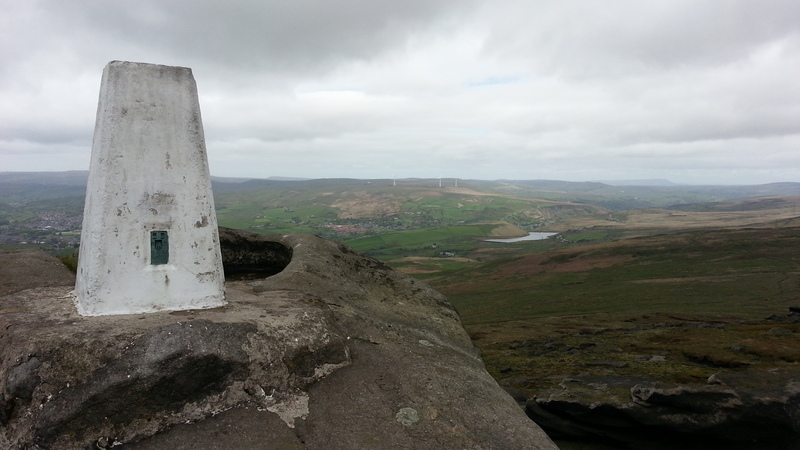 The path from the pub is a wide gravelly affair that runs beside three reservoirs; Blackstone Edge Reservoir, Light Hazzles Reservoir and Warland Reservoir and it’s as you round the corner at the last of these that Stoodley Pike Monument comes into view. 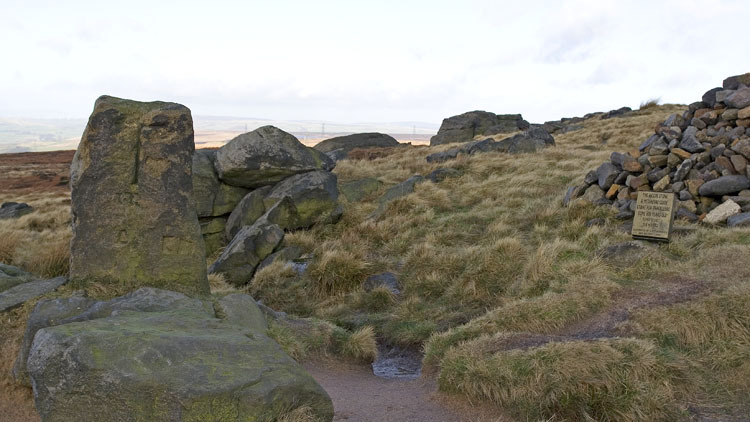 The monument, which stands atop Stoodley Pike Hill, was designed in 1854 by local architect James Green, and completed in 1856 at the end of the Crimean War. It replaced an earlier structure, started in 1814 and commemorating the defeat of Napoleon and the surrender of Paris. It was completed in 1815, after the Battle of Waterloo (Napoleonic Wars), but collapsed in 1854 after an earlier lightning strike, and decades of weathering. 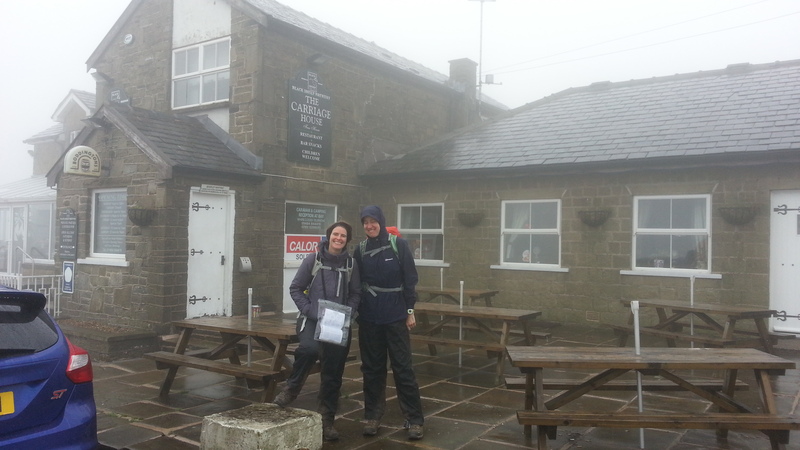 As you can see from the photographs, the weather was improving by the minute and sunshine was now the order of the day! The path that leads to the monument is great and traverses the delightful Coldwell Hill and it was along this path that Silka, who had been practicing ‘Northern’, decided to try out her new linguistic skills on a passing walker. Unfortunately, but rather humorously, her ‘Ow do’ (hello) was met with a vacant stare before the bemused gentleman responded in what we decided was a dutch accent. It was all in good humour and was typical of the banter that we had enjoyed throughout the day. 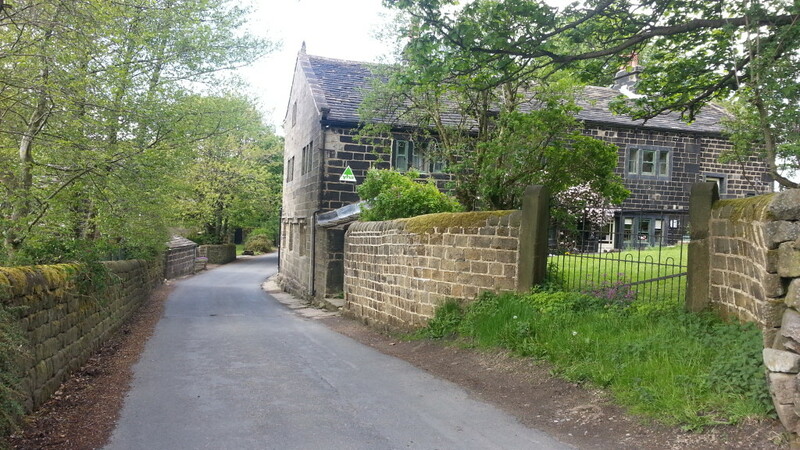 However, it was at Withen’s Gate that I said my goodbyes to Silka and Annette as I was dropping off the Pennine Way to head for Mankinholes where I hoped for a bunk at the Mankinholes YHA whilst the girls continued to more salubrious lodgings in Hebdon Bridge some 4 miles further on. Upon reaching the Youth Hostel I found it to be booked by a private party – something that annoys most walkers and hikers – as it means that the whole hostel is now out of bounds to anyone else, This practice is now more common than ever, and, whilst I can see the need for the YHA to keep profitable if they are to halt the ever closing tide of closures, it means that hostels are becoming more and more an alternative to parties that would normally stay in hotels or B&B’s. I wouldn’t mind it so much, but more often than not there are still free beds, available even when a group hires out the hostel, that could be used by other hikers. You can’t even camp on YHA grounds when the hostel is party booked. To my mind if a group of people want to book space in a hostel then they should only be allowed to book the beds they require – not the whole hostel – thus giving others a chance to stay there. What makes the matter worse is that these group bookings often happen at peak times of the year when hikers, walkers and travellers most need accomadation. Anyway, moan over, I simply set up my tent in a field not 5 minutes away from the hostel and headed to the local pub the Top Brink Inn where I enjoyed a couple of pints of Timothy Taylor’s Landlord with three very interesting and funny locals before retiring to my tent for a great meal supplied by Base Camp Food followed by a good night’s sleep! It had been an excellent day all told and such things as mean spirited land-ladies and closed hostels were far outweighed by the glorious walking and the company I had kept. What will tomorrow bring? 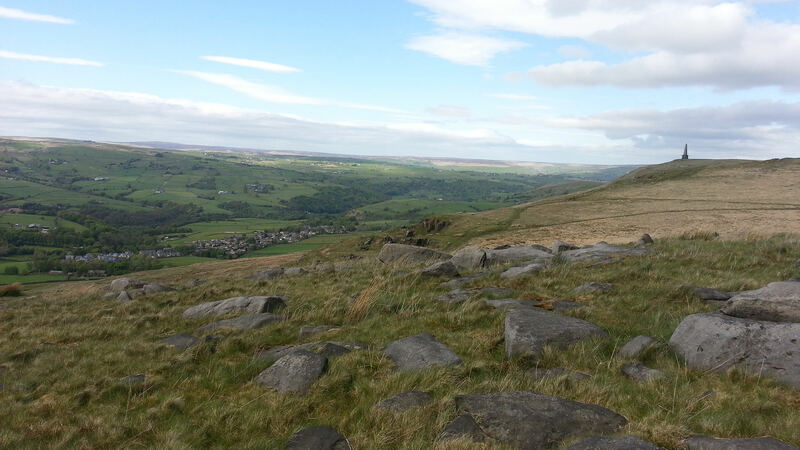 My Adventures, Solo Adventures backpacking, Hiking, Mankinholes, Pennine Way, PW50thAnniversary, Standedge. permalink. Hi Chris i agree with you on yh exclusive booking, so annoying! looking forward to reading through your blog – you’re keeping us in suspense as to whether you made it this time – ?